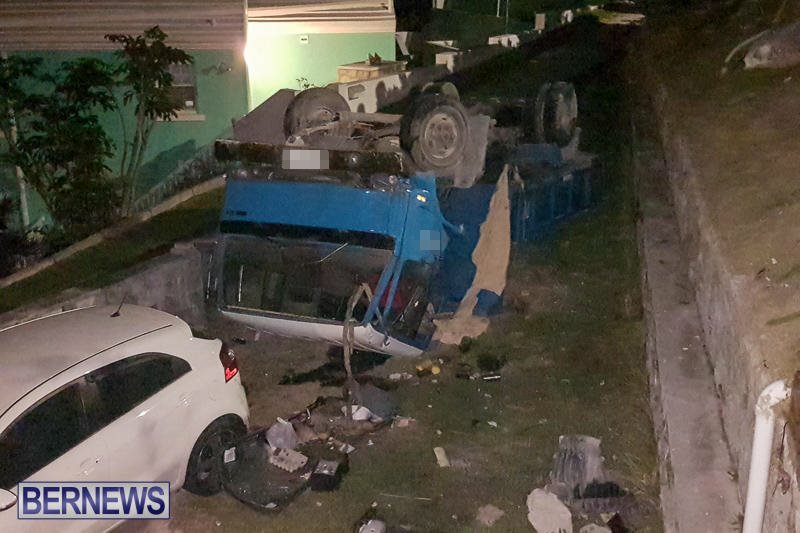 [Updated] Emergency services responded to a collision in Southampton at approximately 11.30pm tonight [March 29] which resulted in an overturned truck and two female occupants being injured. 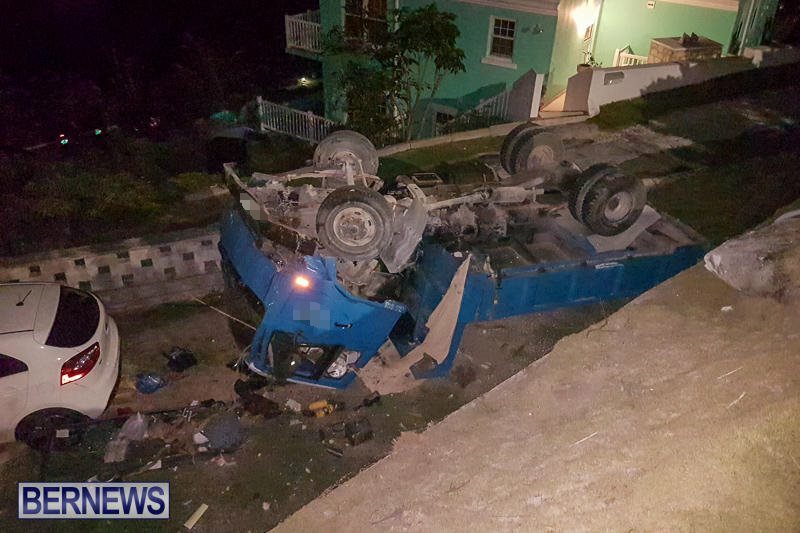 An initial fuel leak from the overturned truck was dealt with by Bermuda Fire & Rescue Service personnel, and a nearby property was also damaged. 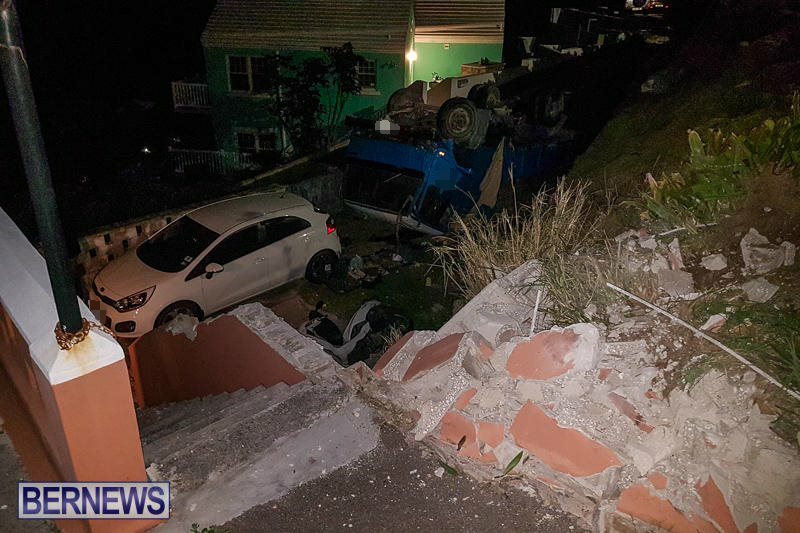 Police Media Relations Manager Robin Simmons said, “Around 11:30pm Wednesday, March 29th police and Bermuda Fire & Rescue Service personnel were dispatched to a reported single vehicle truck crash on South Road in Southampton near the junction with Dolphin Ridge. 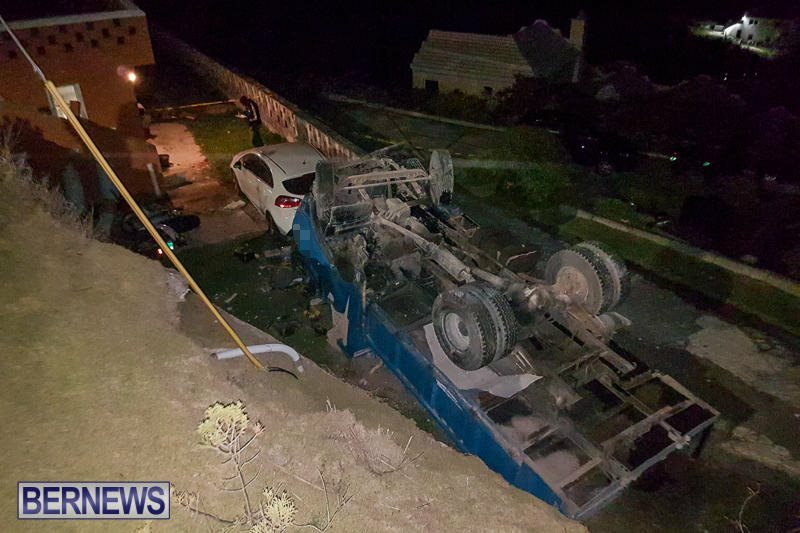 “Details regarding circumstances of the crash are limited at this time, but the truck involved ended up ‎over an embankment. 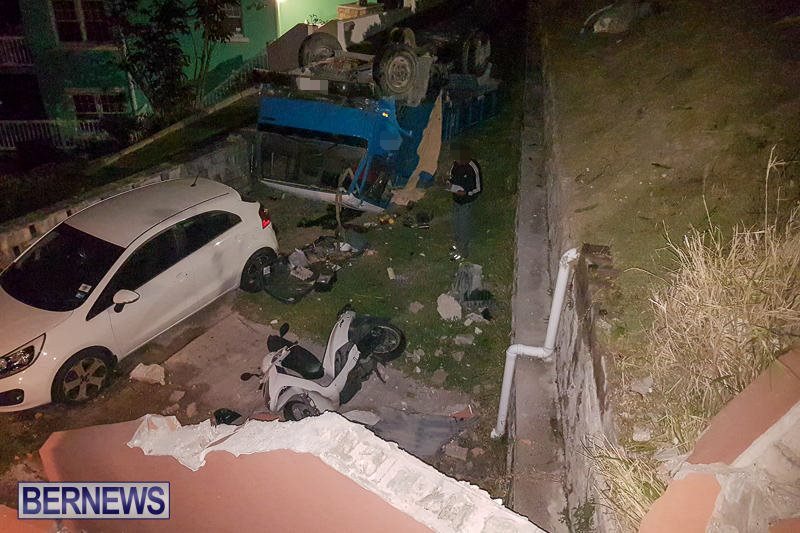 “Apparently the female driver and female passenger sustained injuries which are not believed to be life threatening at this time and were taken to hospital via ambulance. “An update on their conditions will be provided in due course. 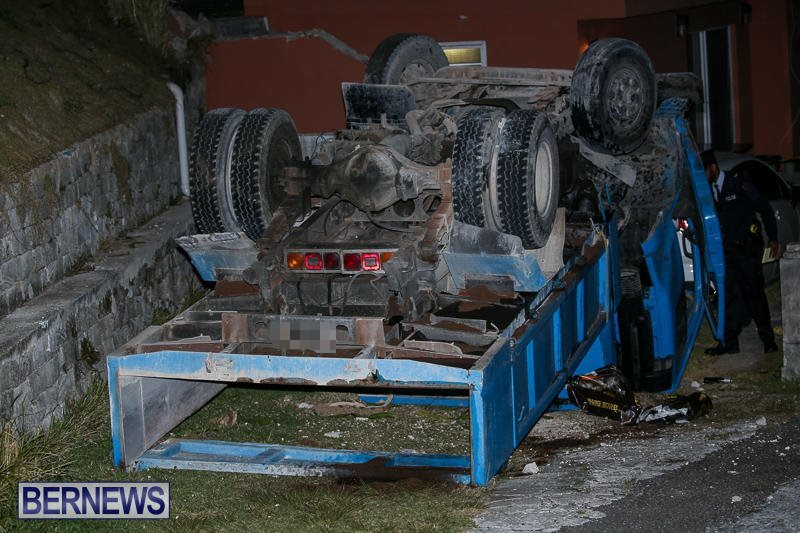 An initial fuel leak from the overturned damaged truck was dealt with by Bermuda Fire & Rescue Service personnel. A nearby property was also damaged. 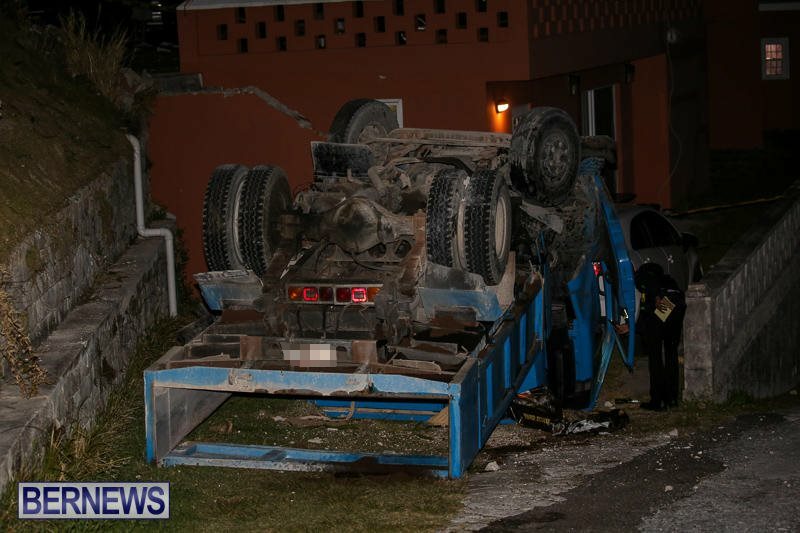 Update March 30, 11.52am: The police said the driver, a 33-year-old woman, was arrested on suspicion of impaired driving. 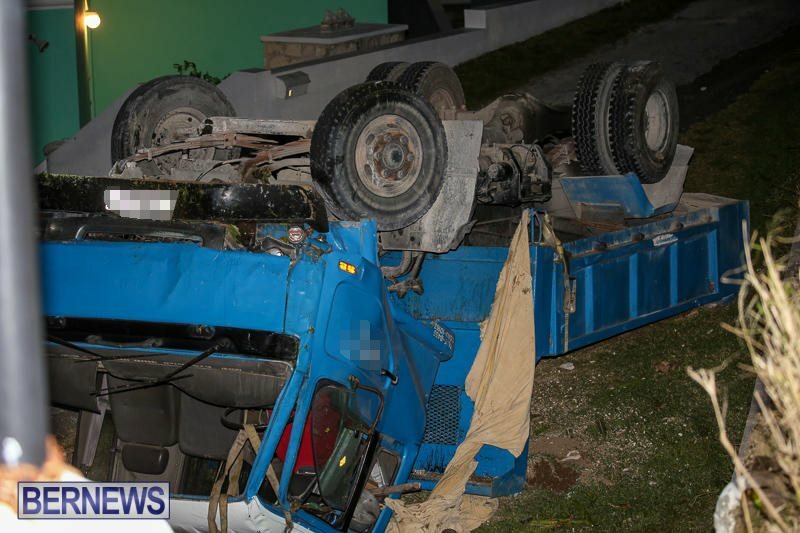 A police spokesperson said, “At last check the 33-year-old Southampton woman driving the truck involved in a reported single vehicle truck crash on South Road in Southampton near the junction with Dolphin Ridge around 11:30pm Wednesday, March 29th remained at the hospital receiving treatment for her injuries and will likely be admitted. “The 27-year-old Southampton woman who was a passenger in the vehicle at the time and also injured, was treated and later discharged. There were no other injuries reported and arrangements have been made to retrieve the truck from that location. “The driver has been arrested on suspicion of impaired driving. She was then released on police bail pending further inquiries. Looks like it missed de car by inches, but de bike didnt get spared. Hope de injuries are not too bad. From my guestimation they were reversing. What’s a heavy commercial dump truck doing on the road at 11:30pm? A truck can be on the road until 12am as far as I know. Fortunately there has been no loss of life, and now the next level of consideration is who pays for what…it looks like a drunk driving charge is soon to come. It reminds me to be a bit more vigilant, um had a few fender benders over the years. This lady should not be allowed bail for a crime such as this. In any other country being in charge of a heavy goods vehicle carries huge responsibility and doing so while impaired is a very serious offence. I sincerely hope she is prosecuted to the full extent of the law, which should have inevitably very serious consequences on her livelihood.